The research area GC&VE at PERCRO investigates and develops new technologies and algorithms to allow the management of highly complex geometrical models. PERCRO's innovations allows to optimize the organization and the use of computing resources both in terms of Hardware and Software. 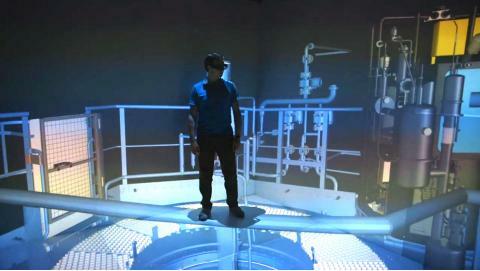 The group design and develops fully immersive interacting environment from small (wearable) application, up to large (CAVE like) environments. Research topics include projection augmentation systems, mixed reality environment, color and geometry distortion compensation, image synthesis and rendering for distributed virtual environments. Focus of research is based on high-efficiency rendering-algorithms, realtime photorealism (illumination, shadowing, raytracing, material properties,...), realtime geometric compression algorithms to store, transmit and render 3D information on the fly, the spatial and cromatic coherence information with those that are perceived by the VE user. The group is active at international research level and cooperating with several Regional companies for the design and development of immersive applications and systems for personnel training, plant management, appliance maintenance.